Now in its fifth edition, Hydraulics in Civil and Environmental Engineering combines thorough coverage of the basic principles of civil engineering hydraulics with wide-ranging treatment of practical, real-world applications. This classic text is carefully structured into two parts to address principles before moving on to more advanced topics. The first part focuses on fundamentals, including hydrostatics, hydrodynamics, pipe and open channel flow, wave theory, physical modeling, hydrology, and sediment transport. The second part illustrates the engineering applications of these fundamental principles to pipeline system design; hydraulic structures; and river, canal, and coastal engineering—including up-to-date environmental implications. A chapter on computational hydraulics demonstrates the application of computational simulation techniques to modern design in a variety of contexts. 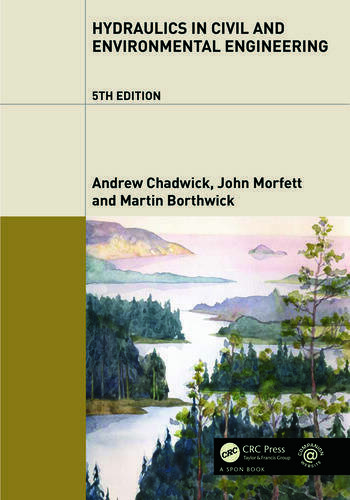 Hydraulics in Civil and Environmental Engineering, Fifth Edition is an essential resource for students and practitioners of civil, environmental, and public health engineering and associated disciplines. It is comprehensive, fully illustrated, and contains many worked examples. Spreadsheets and useful links to other web pages are available on an accompanying website, and a solutions manual is available to lecturers. Andrew Chadwick is a visiting professor at the University of Plymouth, UK, and former Professor of Coastal Engineering at the University of the West Indies, Trinidad. John Morfett was head of hydraulics research and taught at the University of Brighton, UK. Martin Borthwick is a senior lecturer at the University of Plymouth, UK, and teaches hydraulics, hydrology, and water resources. "This book is an excellent standalone reference for education in the field of hydraulics and fundamentals of fluid mechanics. The book gives theoretical considerations and encourages students to learn by inspiring them with insights into the real world of engineering. The book is also useful for practical engineers, providing a good overview of realistic hydraulic engineering problems and their solutions." "Outstanding coverage of practical engineering applications that is accessible to students." "I have found this book to be an ideal standalone reference to the teaching of hydraulics and basic fluid mechanics, as part of engineering undergraduate degree schemes. It is useful, also, in graduate study and applications. "Part II" provides a good overview of hydraulic engineering applications, which does a great job in motivating students to learn and inspiring them with insights of the engineering world."